Zambia honoured the demise of their former players in style, after they edged out highly ranked Ivory Coast to win the African cup of nations in an entertaining two hour match in Libreville stadium, Gabon. Chipolopolo came into this game with so much confidence and determination, which was evident from their lovely sleek moves portrayed in the game. Zambia’s captain Christopher Katongo along with Emmanuel Mayuka, Nathan Sinkala and Isaac Chansa displayed an excellent performance tormenting the Ivorian defence.The four blended in well, producing beautiful moves only that they lacked the finishing power.They continued working hard in the set pieces but unfortunately they did not materialize. Chipolopolo coach Herve Renard could be heard shouting from the other side urging his players to press on as the fans cheered to the high spirited Zambian side. On the other hand, Ivory Coast could not believe they were outplayed by the Zambians as they had registered long before the tournament that they were the favorites. Chelsea talisman Didier Drogba missed a penalty kick in the normal time, after Gervinho was brought down in the box by Chansa which would have sealed the victory for the Ivorians. Drogba was filled with emotions throughout the match, but it was clearer during the extra minutes knowing deep down that his missed penalty would have changed the game. Tension got high in the dying minutes of the extra time, as the dreaded penalty shootout approached .Both teams switched to attacking mode but the two defense stood strong and now the only thing that would separate the two sides were the penalties. Drama unfolded as the sides took the spot kicks, no one missed the penalties till it reached seven. The moment Kolo toure headed towards the ball, any Arsenal fan would have known something wrong was bound to happen, and indeed he missed the penalty that would have given them the victory. Rainford Kalaba reignited the Ivorians hopes after he shot wide, but Gervinho wasted the golden opportunity that would have handed his country the win. All Zambians hopes lay solely on Stopilla Sunzu a fact he knew too well as he went to take the shot, he did not disappoint as he confidently shot in a wonderful kick that sent the Chipolopolos to an ecstasy. It was a historic achievement for the Zambians who have made 15 appearances in the tournament failing to clinch the cup in the 1974 and 1994 finals. Finally Zambia’s great Kalusha Bwalya lifted the African cup of nations trophy in memory of his teammates who died 19 years ago in a tragic plane crash as the Ivorians watched in disbelief Zambians jumping and dancing round the field. The Zambians proved that big names in football is nothing, rather confidence, teamwork and hard work is all that is needed. High flying Arsenal winger Gervinho helped his team to secure a place in the finals by scoring the solitary goal in an entertaining clash against Mali. Ivory Coast accomplished their mission by reaching the African Nations Cup final as the tournament produced yet another surprise when Zambia eliminated highly ranked Ghana. An excellent sprint by Gervinho along the wing to the back of the net just few minutes in to the stoppage of the first half, sealed the expected win for Ivory Coast. The Elephants are now considered as the tournaments favorites as they are up against Zambia who unbelievably eliminated Ghana in yet another semi-final entertaining match. Zambia’s Emmanuel Mayuka struck just 12 minutes from time to drown Ghana’s hopes of winning the African title after more than 30 years of wait. Well everyone thought and also predicted an electrifying final between Ivory Coast and Ghana but that was not to be. 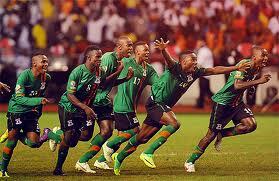 Let us wait and see how the showdown will be between The Elephants and Chipolopolo.